In the middle of the Seahawks’ fifth-ranked run defense is Colin Cole, a nose tackle who was once told he didn’t have what it takes to play in the NFL. Look who’s smiling now. As Colin Cole was being led to the hallway outside the Seahawks’ locker room, he had no idea what awaited him: TV cameras. And lights. And reporters. And tape recorders. Not the reception the team’s nose tackle usually gets. While he draws crowds on the field, the life of an interior lineman can be one of solitude when it comes to media attention. Then, the first question he was asked Wednesday concerned his shoes, not the way Cole has been clogging the middle for a run defense that ranks fifth in the league after two games. More to the point, this sole brother’s on-field game has been as noticeable as his shoes. 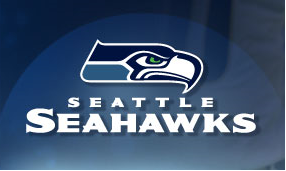 Entering Sunday’s game against the San Diego Chargers at Qwest Field, the Seahawks’ defense is allowing averages of 57 rushing yards per game and 2.0 yards per carry. And Cole has been right in the middle of most of that good stuff. He leads all the linemen with nine tackles, but even more important is the way his disruptive, space-eating presence has allowed others to make plays. “When centers block him, he doesn’t move very much,” coach Pete Carroll said of Cole, whose 335 pounds are packed upon his 6-foot-2 frame to create a body that was made to play nose tackle. The box is that area between the tackles on the line of scrimmage where only the strong survive, and it takes even more to thrive. That style Carroll referred to is “a combination of 3-4 principles with 4-3 personnel,” as Carroll puts it. That style also fits Cole as well as his flashy shoes. 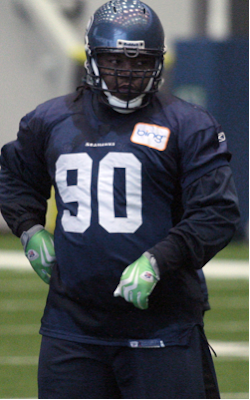 He also was the nose tackle in his first season with the Seahawks, but that was in 4-3 personnel with 4-3 principles. Now, Cole is closer to being the true nose tackle he was born to be. “The defense the way it is right now kinds of allows me to move around a little bit and get singled up a little bit,” Cole said. “So I’m able to move laterally and locate the ball a little bit better. Last year, I was in a gap so it was easier for those guys to get two blockers on me and just kind of stay on me. Obviously Cole is not doing everything by himself. There’s also three-technique tackle Brandon Mebane , who’s also bigger than he was last year but still as active; five-technique end Red Bryant , a 323-pound converted tackle; “Leo” end Chris Clemons , who has played the run better than advertised for a rush-end; Junior Siavii and Kentwan Balmer , two more big, active players who have been used in the line rotation; middle linebacker Lofa Tatupu , the metronome of the defense; active outside ’backers Aaron Curry and David Hawthorne ; strong safety Lawyer Milloy , who will turn 37 in November but is playing like he’s going to be 27; free safety Earl Thomas ; and cornerbacks Marcus Trufant and Kelly Jennings . “We’re really making the holes small and making it hard for guys to be able to get in there and run up the middle,” Cole said when asked for the Seahawks’ secret to their run defense after two games. The way the Seahawks are playing, especially against the run, is hard to overlook. “The first thing that’s always stood out to me about their defense is they’re fast,” Chargers quarterback Philip Rivers said during a conference call interview. “They really fly around. Even more so, to go with that fast, this year’s team (has) that size inside. It’s all by design. Carroll and John Schneider wanted to get bigger, without sacrificing any speed on defense. “We look for big guys to hold the point,” Carroll said. “So you need bulky, big, strong guys. That’s why it’s important for Colin Cole to be part of this defense in the middle. No one is happier than Cole. This is a guy who signed with the Minnesota Vikings as a free agent after not being selected in the 2003 draft. He spent time on the practice squads of the Vikings and Detroit Lions that season, only to be released. He was on the Green Bay Packers’ practice squad in 2004, before being signed to the active roster in late November. From 2005-08, he started eight games for the Packers. So when the Seahawks went after him in free agency last year, his first reaction was: Where do I sign? That discussion was interrupted by a commentator on TV. That commentator obviously didn’t account for the soul of this sole man.